Thicken the milk, egg yolks, sugar, rosemary and the lemon peel. Sieve over the chocolate together with the gelatine. Finally, toss in the whipped cream. Same procedure as the above mousse. Peel the apples and cut into square pieces. Sauté the butter, lemon juice, apple pieces and the white pepper on the pan until the apples are just tender. Finally, toss in the acacia honey. Pour the apples on a cold plate and cool down. Beat butter and sugar white. Add the eggs little by little. Sieve the dry ingredients and toss into the mixture. Finally, pour the milk into the mixture. Spread the dough on a baking plate with edges and bake at 180 ˚ C for about 8 minutes. Melt the chocolate and the praliné and toss with the pumpkin kernels and the crispy flakes. 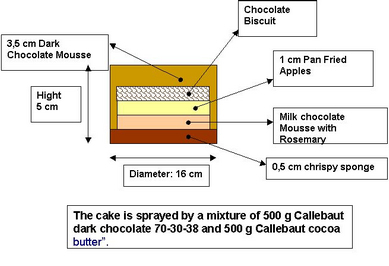 Spread the mixture in a thin layer on a baking plate and cut out the sponge in measured sizes. Spread red/orange colour on plastic. Afterwards spread white chocolate on the colour. Same procedure as for the red/orange decoration.